Smoke rises from a factory in developing Asia. Photo credit: ADB. Rapid economic growth in the Greater Mekong Subregion (GMS) has lifted millions out of poverty and helped the six member countries make progress on their Sustainable Development Goals. However, the push for industrial development has resulted in increased pollution and related risks. Good data is essential for the GMS countries to be able to design and enforce pollution control regulations. Unfortunately, environmental regulators are often working with insufficient data because of staff, budget, and technology constraints. To deal with this problem, the GMS Core Environment Program recently applied the Industrial Pollution Projection System (IPPS) in the region. 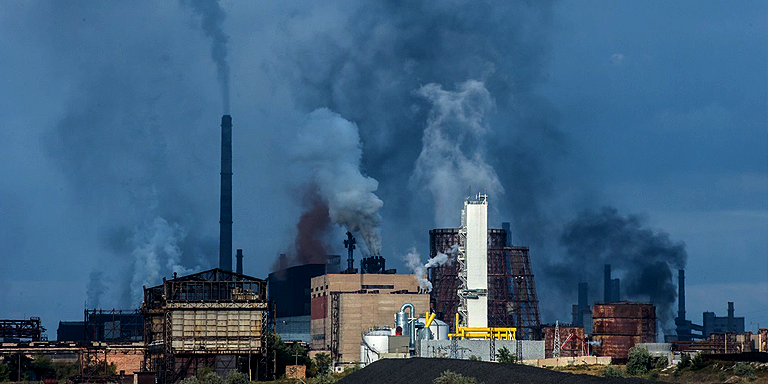 The IPPS was designed by the World Bank to help countries gain insights into the sources of their industrial pollution, particularly in factories. The IPPS builds on industry survey information containing each enterprise’s type and quantity of manufactured products, number of employees, location, etc. Using this information, the IPPS applies coefficients for 16 key air, water, and land pollutants to estimate emissions. In effect, the IPPS provides “appropriate estimates” in the absence of more direct (emissions monitoring) data on industrial pollution at the enterprise level. In Thailand, the IPPS was used in 2001 to estimate water pollution from industrial estates. In 2006, the World Bank, together with Viet Nam’s Ministry of Natural Resources and Environment and Ministry of Industry and Trade, conducted an environmental analysis of pollution from the country’s manufacturing sector using the system. Since 2014, the CEP has responded to requests from the governments of Cambodia, the Lao PDR, and Myanmar to help build much-needed capacity to evaluate their industrial pollution risks and to support strategic responses. The CEP applied the IPPS in the Lao PDR in 2014 and 2015, and in Cambodia in 2016. In Myanmar, the CEP reviewed the country’s manufacturing sector enterprise database in 2017 in preparation for a full IPPS exercise at a later date. Most pollution is generated by a fraction of industrial activities (e.g., the 6 top polluters of 48 types of manufacturing enterprises in Cambodia). The bulk of pollution loads from top polluters come from only a few enterprises, but these tend to be large. For example, 10 cement lime and plaster firms account for more than 30% of industrial air pollution emissions in the Lao PDR. These few enterprises are often concentrated in a small number of locations, such as urban fringes, economic and industrial zones, and major transport and trade areas (e.g., near ports, airports, and national and regional roads). These findings suggest that large reductions in industrial pollution discharges could be achieved by focusing on certain sectors and on a limited number of manufacturing facilities in a few locations. Applying the IPPS is an important first step toward mainstreaming pollution concerns into strategic planning in the GMS. To leverage the full potential of the IPPS, countries should invest in more complete and better-quality information about their manufacturing firms since existing enterprise databases in some of the countries are outdated and have gaps and inconsistencies. Guided by the IPPS results, countries should then target the most polluting facilities for on-site emission measurements and use this information to gradually build a representative national pollution inventory. In the second step, GMS pollution control authorities should use the improved enterprise and pollution inventories to create specific national pollution load coefficients to replace the internationally derived IPPS coefficients. With each round of on-site measurements, these national coefficients can be verified and refined in a process that would steadily improve the quality and credibility of the national pollution projection systems. It is important to emphasize that the IPPS should not be used as a bridging technology that is phased out once on-site pollution and emission monitoring and enforcement procedures are established. Instead, regular emission projections should become a key part of GMS strategic planning procedures, as they add unique insights into likely future pollution trends that on-the-ground monitoring cannot provide. For example, countries could use the IPPS or nationally developed pollution coefficients to anticipate which geographic locations (such as a province or perhaps a new special economic zone) are likely to face new or more significant manufacturing pollution in the coming years. This will enable more proactive and preventive responses, rather than reactive (and often more expensive) “clean-up” actions. Pollution is categorized into three major groups: air, water, and soil pollution. Various sectors contribute differently to these pollution types. Manufacturing has the widest spectrum of pollutants, many of which are extremely harmful to people and the environment. In relative terms, some of the largest polluters come from the chemical, pesticide, oil refining, petrochemical, metal smelting, iron and steel, food processing, textile, leather tanning, paint, plastics, pharmaceutical, and paper and pulp industries. The pollution risk also depends on the state and structure of a country’s manufacturing sector. Some of these high-risk activities might play only a minor role in some countries, while other relatively lesser, polluting manufacturing activities are problematic due to their large share of the overall manufacturing sector. Energy from fossil fuels emits harmful compounds such as sulfur dioxide and nitrous oxide, as well as climate-changing GHGs. Air pollutants such as these contribute to acid rain, ground-level ozone, particulate matter pollution, haze, and eutrophication. Although significantly lower than pollution from fossil fuels, some renewable energy sources also generate air pollution, for example, from the building and operation of hydropower plants. Agriculture is a major contributor to water and soil pollution. Fertilizers, pesticides, and sediment are among the main sources of agricultural pollutants that degrade and contaminate soil, groundwater aquifers, and surface water—and can directly impact the food chain. Agriculture is also a major GHG emitter through land use change such as deforestation and the decomposition and combustion of organic residues such as crop waste and manure. Transport pollutants are emitted by road and non-road sources (aircraft, trains, ships, vehicles, and machinery) and include carbon monoxide and carbon dioxide, nitrogen oxide, hydrocarbons, particulate matter, and air toxics. The construction of roads and other transport infrastructure can contribute to pollution—directly by facilitating particulate matter emissions and indirectly by enabling land use changes. New transport infrastructure will introduce mobile source pollution (from vehicles) into areas where there was none before. The emerging shift to electric cars has the potential to greatly reduce mobile source pollution, but it will continue the problem of point source pollution if fossil fuel remains a major source of electricity production. Asian Development Bank. Projecting Industrial Pollution in the Greater Mekong Subregion. Greater Mekong Subregion Core Environment Program. The GMS Core Environment Program Strategy and Action Plan, 2018-2022.